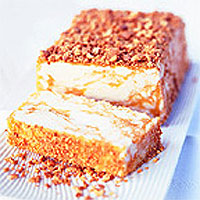 Apricots and fromage frais have a special affinity, as you will see if you try this ice cream. If you prefer, serve the ice cream in scoops, sprinkled with a few crumbs of ratafia - small almond macaroons. Amaretti biscuits provide a stronger, even more almondy crumb. Drain the fromage frais in a lined sieve for 30 minutes. Place the sugar and vanilla pod in a non-aluminium saucepan with 200ml cold water and slowly heat, stirring to dissolve the sugar. Boil for 2 minutes, then slip in the apricots and let them poach gently, half-covered with a lid, for 6-7 minutes or until just tender. Allow to cool. Remove the vanilla pod and scrape out the seeds into the apricots. Purée the apricots and syrup in a food processor. Stir in the brandy or kirsch and pour into a polythene freezer tray to make a shallow (3-5cm) layer. Freeze for about 2 hours, or until just firm. Beat the drained fromage frais in a bowl until smooth. Whisk the cream until softly stiff, then fold into the fromage frais. Scoop the frozen apricot slush into a food processor and whiz until smooth. Fold the fromage frais and cream into the mixture and adjust the taste with a little lemon juice. Line a 25 x 10cm loaf tin with greaseproof paper, pour in the mixture and freeze until solid. To serve, place the ratafia crumbs on a large sheet of greaseproof paper. Let the ice cream soften in the fridge for 10 minutes, then turn out on to the crushed biscuits. Remove the paper from the ice cream and press biscuit crumbs all over the surface. Refreeze until ready to serve, or let soften for 10-15 minutes in the fridge before serving. Slice thickly and serve with extra slices of fresh apricot.